Mini Voice Recorder - Voice Activated Recording - 572 Hours Recordings Capacity - 24 Hours Battery Life - Password Protection - aTTo digital | The Best Spy Tech Store Online! 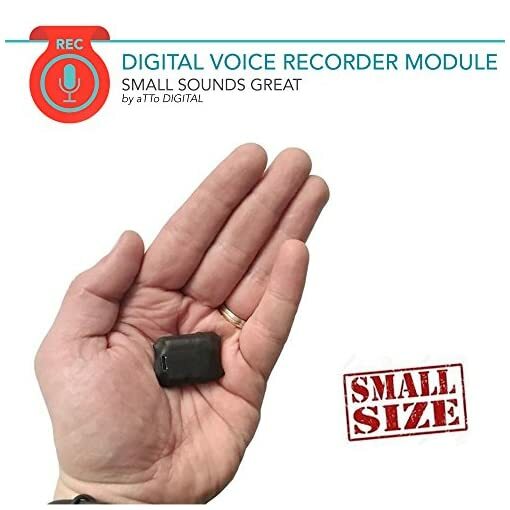 SAM08B-8GB spy recorder is a super tiny professional voice recording module manufactured by aTTo digital, which offers discretion and performs CLEAR HQ SOUND audio monitoring of everything that is discussed within its radius (up to 10 meters). SAM08B-8GB is in the Top 3 of the smallest smart voice recorders available on the market. Professional equipment! The spy recorder also has a configurable voice activation function that will allow it to record only when somebody talks, the moments of silence being automatically deleted to avoid long hours of silent recordings. SAM08B-8GB can also record on continuous mode and very important, it can record while charging! Its small dimensions and weight make it very easy to conceal or hide everywhere (it is very difficult to be detected). It weighs only 8 grams and has the following dimensions 27x22x8 mm. The exterior is made of a rubber material, very thin and very resistant specially designed for SAM08-8GB audio recorder.